One bedroom, one wet room. Wood burning stove. Private garden and terrace. Recently awarded 5* rating by Visit Wales, along with cycling and walking awards and nestling next to a 16th Century Old Rectory "The Cwtch" is a stunning, contemporary cottage, built at the foot of a Norman Motte and Bailey Castle mound and 100 yards from a Norman church which still serves the local community twice a month, with the remains of a Roman camp just 200 yards, steeped in history. 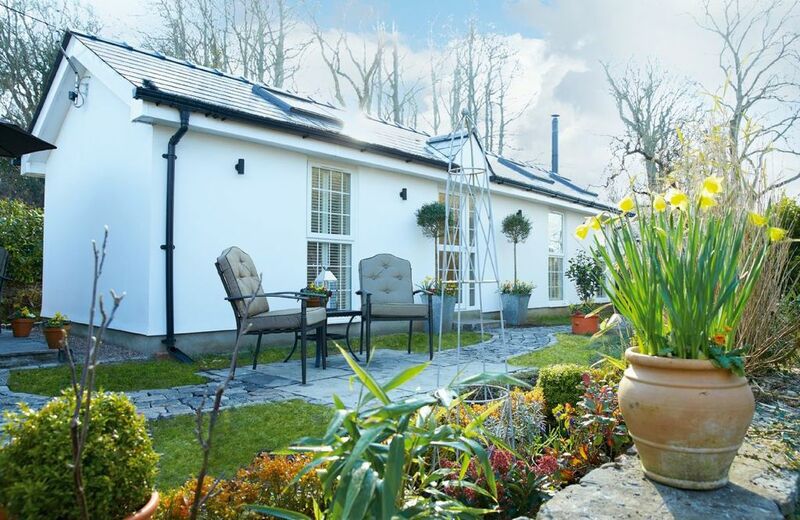 This detached, single-storey holiday cottage sits in the owner's grounds of some 4 acres of delightful gardens, which you are welcome to explore and is set in its own private garden and terrace, ideal for relaxing or alfresco dining with a gas barbecue provided. This one bedroom cottage has a super-king sized sprung mattress bed for a fantastic night's sleep, with a large wet-room and open plan kitchen, dining, and sitting room with a wood burning stove, complete with an abundance of logs - perfect for a cosy night in. Wet room with electric shower and wc. Wood burning stove. Electric central heating. Fitted electric oven with separate electric hob, built in microwave. Fridge with small freezer compartment, small freezer, dishwasher, washing machine and tumble dryer. Smart TV in the open plan sitting room. Radio/CD player with iPhone docking. WiFi*. Gas barbecue. *Please note that internet access is offered at this property for recreational purposes only and is not meant for business use. Speed/service may vary depending on the package obtained by the owner which is provided to guests free of charge. Should guests experience difficulties or loss of use, neither the owner nor Rural Retreats will be held responsible.